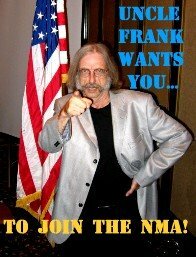 Nine days until the NMA reunion. Who's in, who's out? John Vazquez is in. He just wrote to tell me he'll be at there "with bells on." I'm glad to hear this, as he's had to miss a few reunions; his duties with the American Legion often conflict with our schedule, a reasonable excuse for a vet. John was helpful in making me feel at home at my first reunion, Louisville in 2006. I was nervous about playing with the bands, as physical injuries and surgeries had kept me away from music for ten years. John understood this from his own experience, and went out of his way to help me feel secure on the bandstand. Lee Hudson? I don't know. I broke down and wrote to him, deciding I'd rather know in advance whether the Enemy of Freedom was coming to Orlando rather than be unpleasantly surprised at the last minute. I haven't heard back. No news is no news.